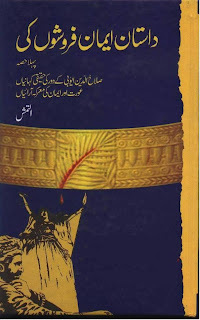 Dastan Iman Faroshon Ki (Series) by Inayatullah Iltumish is about Sultan Salahuddin Ayubi, the person who for twenty years braved the storm of the Crusaders and ultimately pushed back the combined forces of Europe which had come to swarm the Holy Land. This is one of my favorite book. When Allah decides to turn the fate of a group he gives them great leaders. Salhuddin Ayyubi was one amongst of our great leaders who changed the fate of the holy land for more than 800 hundred years. Today the holy land is waiting for one more Ayyubi to make it holy and place of peace. By reading this book I got to know how the real muslim stand against all barriers of the world to spread peace and Justice. dear brothers thanks a lot this is very very good historical series. i realy appriciate you people for this jobs, and bringing into the picture for your muslims, i pray allah to create one more salauddin ayubi know or in feature -ameen, i request every muslim brothe to read this. dear brothers plz try to read this book its very essencial for you. I have red this book some 15 years ago. Such a beautiful history of muslims particlarly history of Sultan Salah-ud-Din never written before. Now I'm going to read it again bur this time through internet. Many many thanx to the brother / sister who uploaded this book. Can anyone mail me the summary of it's 5 parts please? I read this book years ago, & i started reading again because i am very inspired by this story, i have completed 1st part, Beshak aisi kahaniyon se hamara iman pakka aur pokhta hoga. Aisi kahainiyon koi aur bhi kitaabein ho tou mujhe zaroor bataiyega. It is a one of my favorite books, Friends If you like to read more these kind of books so please must read these books also. Both books are very good and same Author and writer. It is a one of my favorite books, Friends If you like more these kind of books so please must read these books also. Being in the name of Allah. My fellow muslims, my wish is that we must study Quran and Hadith and get united. we are all muslims, we are only muslims. I got this book on 5 parts about 20 years back, I lost that when I got that I read many times, may be 5 or 6 times, really I need this book again to read but its published from India and I am in South africa, I like this book very very much, but now thanks GOD I find it here to read it again, thanks for uploading. There is no volumes written in hindi or english? plz am trying a lot to get the hindi or english version. The three dimensions of a personality..! The Answer to Fitna Movie. The Universal Code of Superiority.